This friendly Malbec delivers big taste for the bucks. Deep purple color with aromas of plums, violets as well as spiced and mineral notes that are typical of wines from the Uco Valley. The partial oak ageing grants it mild vanilla and caramel notes. Gentle in the mouth with well rounded and ripe tannins, balanced acidity and medium-long finish. Malbec is best enjoyed with all sorts of red meat dishes, asado, grilled steaks or lamb, beef or cheese empanadas. Named after the owner’s son Juan who currently lives in New York. 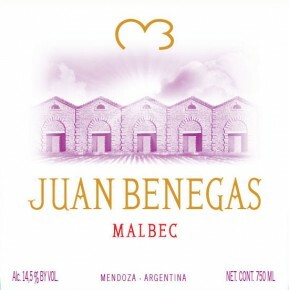 Starting with the 2013 vintage Juan Benegas has a screwcap. Vinification is in concrete vats. Only 50% of the wine is aged in French oak fro 6 months, while the rest remains in concrete until bottling.